This is a colorful, detailed vintage map of Mexico from a 1913 atlas. I love the colors of maps, especially vintage maps. 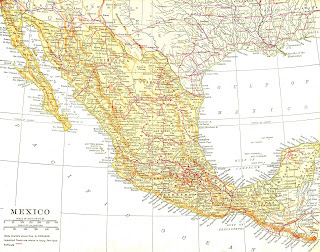 The orange and red lines in the yellow of the land of Mexico is really pretty and interesting. Map illustrations make great backgrounds for so many various projects, especially vacation and traveling projects, of course. I've posted another map background here. I hope you enjoy! Thanks, Carolyn. It's always such fun to see what you have for us!